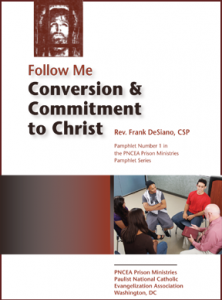 You can help provide quality Catholic pamphlets to prisoners by supporting the Paulist Prison Ministries Pamphlet Series. Every $5.00 you donate provides a packet of 10 pamphlets, including printing, shipping and handling. Each pamphlet is 24 pages (12 in English and 12 in Spanish, bound together) and includes discussion questions and Testimonies from Prisoners. Click on images below to view the pamphlets.